Two days in a row now I am up before six. This is not my usual routine. It’s been hours since I rose in Hawaii, got a taxi (another $45 gone), and found my gate at the airport. We’re on the plane and have been for three hours now, less than two of that airborne. I am in a window seat, but there is no window; just a bulkhead that is rather in the way. Technically there is half a window, mostly covered by the seat in front of me, but it’s enough to squeeze a lens into at least. I was sort of counting on that left side elbow room, but it’s not here. The plane is full of island people heading to the middle of the Pacific, a few Americans and me. And guess what – Pam’s here too! I am surprised to see her and happy for her too. She was determined, and here she is, after getting to Hawaii past 11 pm last night and dozing in the airport. You go, Pam! Our plane will stop at Majuro, then Kwajelain and then our island, Kosrae (pronounced “Kaws-Rye”). 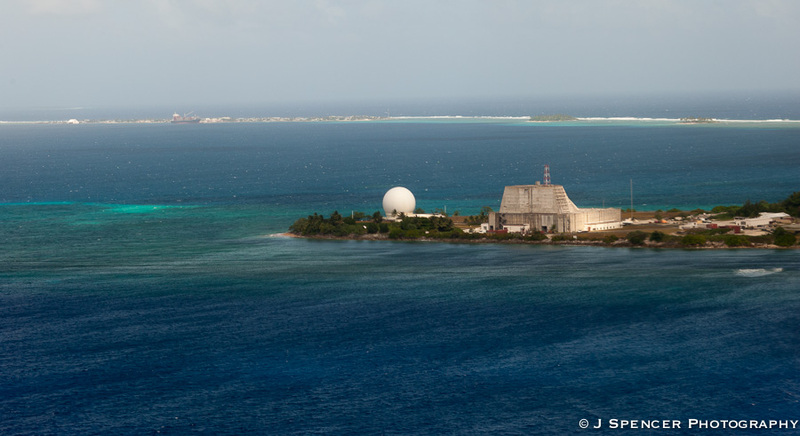 It will go on to two other islands and then land in Guam, but without us. I don’t know what awaits in Kosrae, but it will be bright and warm, I suspect. We had a delay on the tarmac because we had to sort out the baggage. Someone had left an unidentified bag and some more things inside black plastic bags on the jetway outside the plane. The nice fellow who was managing this flight’s baggage found the owners of the black-plastic goods and explained to them that names and addresses were needed next time, please. They seemed surprised. Finally the unidentified suitcase was claimed after it was escorted down the aisle for a show-and-tell by the flight attendant. At long last, we were cleared for departure. For some reason, departure was a long time coming. We didn’t take off until about 35 minutes after we were scheduled to. Probably we missed our window; there was definitely a queue to take off. There are movies on the plane and the people on the plane are all very polite, though most of them are, well, plus-sized. It is a pleasant flight despite the unexpected lack of elbow room on the non-window window side. 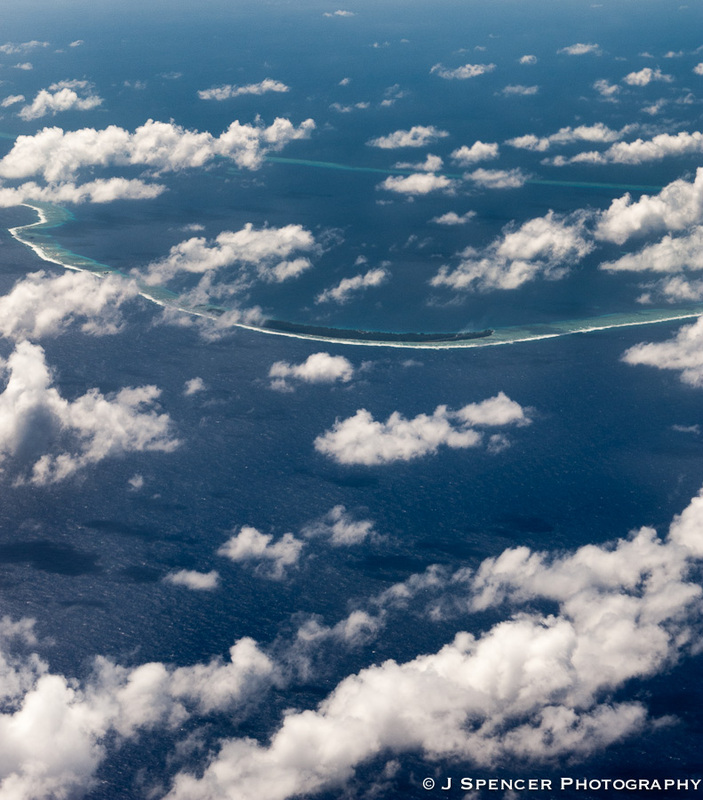 After a while on this flight, I started to see atolls! 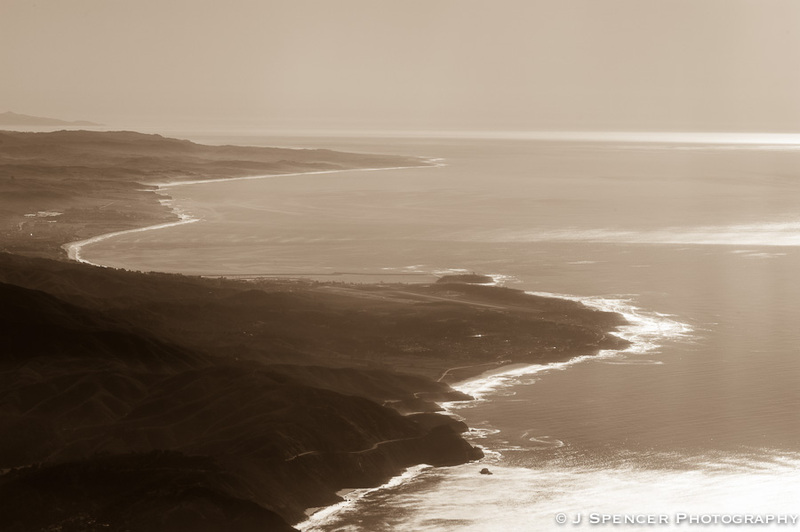 For a long time it was just the vast Pacific, but then there was land. 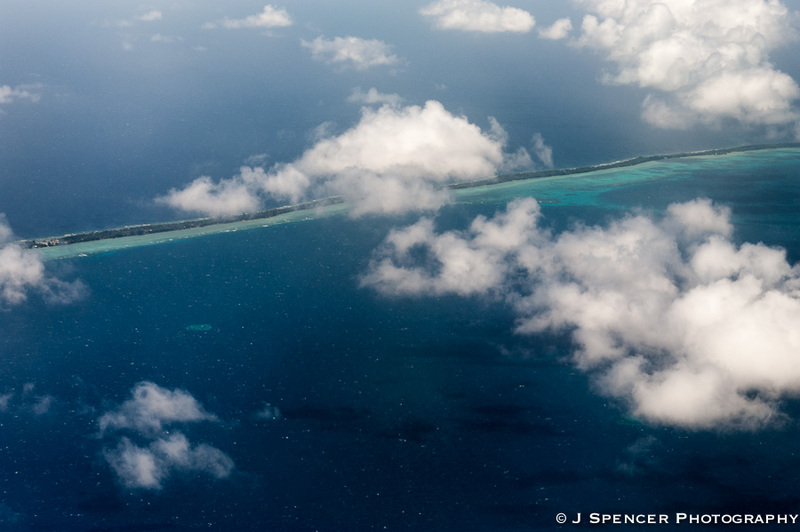 Before I knew it, we were landing in Majuro, the capital of the Federated States of Micronesia (the FSM). I didn’t get off the plane, but you could if you wanted to stretch your legs. It’s a shuttle, effectively, connecting the FSM islands. I really should have gone out because we were delayed an extra hour on Majuro for a mechanical. Fortunately they have a mechanic there so we were safely airborne again instead of spending the night on the island. I walked around in the plane and stood up, and got inspected by officials asking about our luggage. There were lots of forms to fill out in advance of Kosrae about fruits and vegetables, and then a household survey regarding gender, income, reasons for coming, etc. Talk about a marketing check. This turned out to be standard for any FSM departure as I was to find out later. Soon we took off and less than an hour later landed in Kwajalein, where you are not supposed to take photographs. 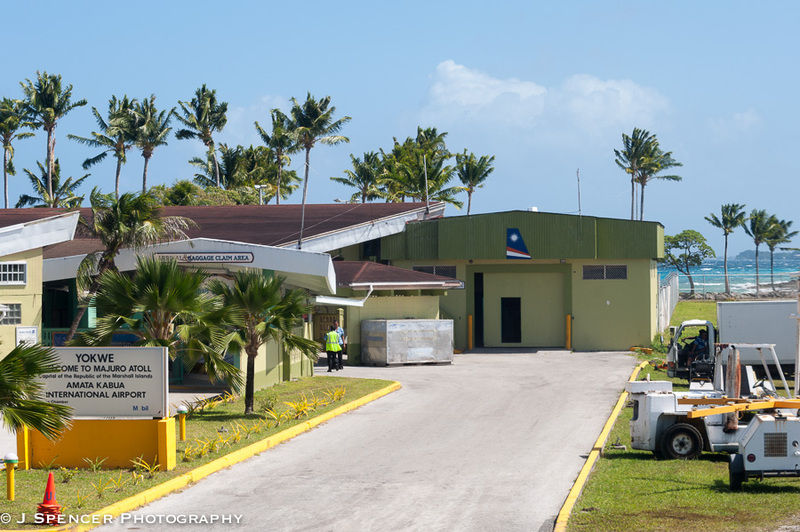 It’s a big US military depot, and it looks like one too, instead of the tropical paradise it could be. Majuro and Kwaj are both pretty flat, unlike Kosrae with its mountains. 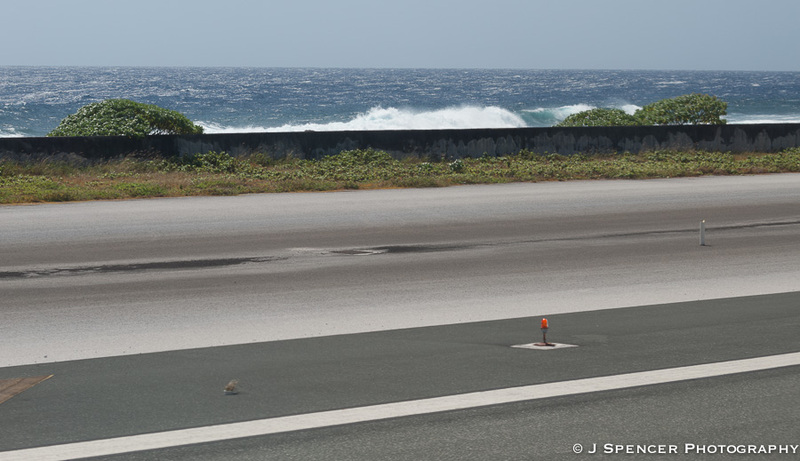 Not much to see in Kwaj, and we were not allowed to deplane either. Maybe with my federal ID, I could have, but it was no matter. Kosrae was next! And I had people to talk to. The folks who boarded the plane in Majuro in the row next to me were Kosraeans. They asked me lots of questions, but were very nice, and it turned out that they lived next door to my resort. I found out much later that the lady was a princess of the island. They were very welcoming and made me feel right at home. Pam asked them all kinds of questions about the island and what they liked best, and made arrangements to attend church with them the next day. They take Sunday pretty seriously in Kosrae. I set my alarm for 5:50 AM. My friend was coming to pick me up at 7:30 and I had to be ready. It was a departure day. On this journey, I go to all new destinations. Nowhere is familiar, nowhere is a place I’ve been before. It’s been a long time since that happened, and while it is welcome, it is also giving me a little anxiety. The first leg was likely to be pleasant though: Hawaii. Specifically, Waikiki on Oahu. From there, readers, we’re going to Kosrae & Chuuk in the Federated States of Micronesia, Guam USA, and then to Australia to see the Great Barrier Reef and Melbourne, drive the Great Ocean Road up to Adelaide and into the Barossa Valley and finally spend a night in Sydney before departure. I said goodbye to my mother and I knew I would miss her very soon. But before I knew it, my ride had arrived and it was time to go. We went to the coffee shop and gabbed like two old friends are wont to do for about an hour before we headed to the airport. 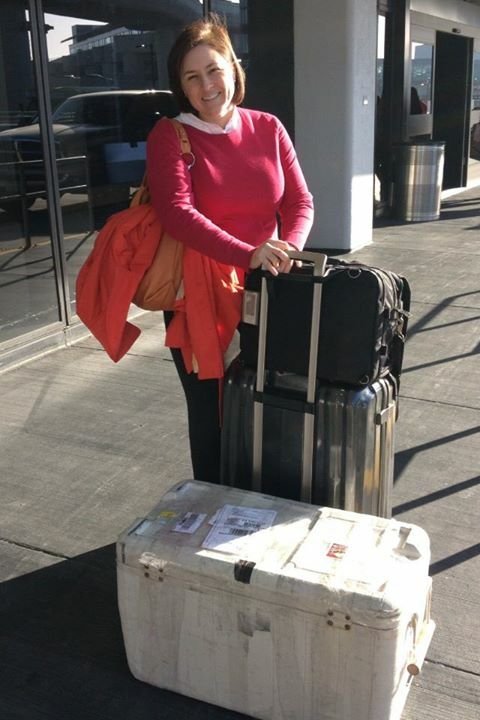 I should mention the luggage. In my quest for adventure, I thought I’d like to try my hand at underwater photography. I did some research and decided I was best off renting a watertight, pressure-proof housing for the camera I already own. Little did I know that the housing and its strobes and cables and arms would arrive in a family-sized cooler chest weighing a total of 44 pounds. Hm. That was more than I planned for. I managed to haul all the baggage to the bag drop at United, got charged $100 in additional baggage fees (ouch), and went to the gate. There, I noticed my phone was nearly out of juice and began the search for an outlet. I found one finally but as I went to plug in my charger, the woman next to it told me it was dead. The one she’d plugged into was live. She had an extension cord with multiple slots and she was willing to share! We got to talking and she said she was flying standby, hoping to get to Honolulu in time to catch a flight to Kosrae. I was stunned. Since I started telling people I was going there, no one so far has even known where this island is, let alone been there or on their way to it. But she knew! Unfortunately she was in standby position #56 so her odds of making this plane were slim. I introduced myself and so did she (Pam) and we chatted for a few more minutes before my boarding group was called. The plane was big – a 2x5x2 seat configuration on a plane the size of the one I took in East Africa back to Europe. Maybe Pam would get on after all? They let in about 20 standby people but there was no sign of Pam. She was not on board. I hoped she’d make it to Kosrae. About five hours later, I arrived in Honolulu. It was 84 degrees, about 65% humidity, and the air smelled fresh and full of flowers. My baggage arrived undamaged, and I looked for a luggage cart. A nice young porter for a tour company saw me looking and ran out to the curb to go get a stray cart – a man who expected no tip, I might add. What a sweetheart! A short search found a taxi and I was on my way to my hotel on the beach at Waikiki. Eventually, $50 and seven miles later, we got there. Ouch. How did that happen? Sigh. This is an expensive island. The hotel was pricey too, but it was a bit of a splurge and there was a view of the ocean. That was all I really wanted, and suddenly I felt so lucky I was overwhelmed. I took some pictures, went down to eat some dinner, and then walked on the beach. I took off my sandals and walked in the surf. The water was not cold and the breeze was not bone-chilling: we were not in San Francisco anymore. That beach walk was all I needed to make my one night in Hawaii a good one. I put my shoes back on, walked around the bustling avenue, bought some postcards and wrote them, and then went to bed. It was just as well that I was exhausted and sleep came easily: I had to be up at 4:30 to catch the next plane. Aloha, then. 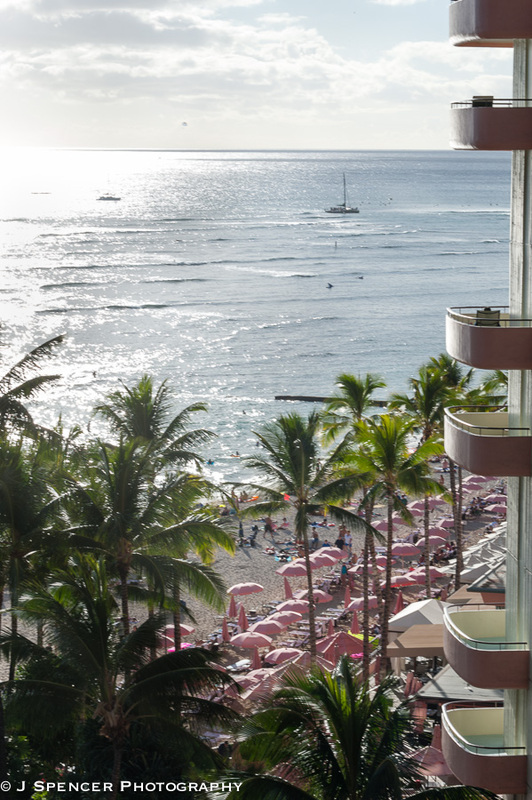 A room with a view – what more could you want in December? You may have guessed from talking to me that I have been to Toronto a few times this year. I have always liked it there. Now that I am living in Maryland, I like Toronto even more. I like it so much I’m trying to get a fast pass clearance for Canadian security (Nexus). Why? Lots of reasons. It’s a home design mecca, a land of great fabric stores, and a place where you can get cold weather fashions that are actually fashionable. 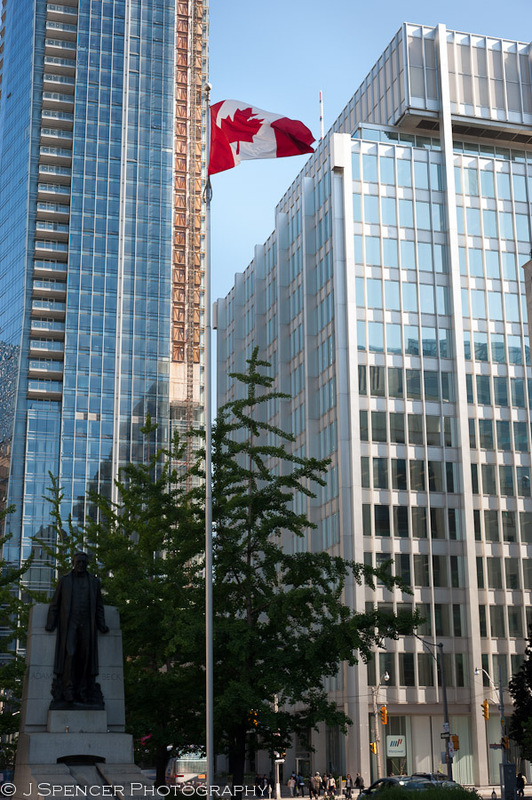 Toronto has great food, super-nice people, sophisticated shopping, an easy metro subway, and a handsome downtown. Even in winter, the town is bustling and fun. What’s not to like? Mostly this post is to give a shout-out to the city I have come to love as the next best thing to San Francisco, or maybe it’s the other way around. It’s possible that San Francisco is the next best thing to Toronto, depending on the season. Ladies tights made out of real wool. These look nice and they are very warm. French cotton flannel in a lightweight hand for shirting, again nice-looking and warm, but not lumberjack style. Things made to last, even the manicure scissors at the drugstore; Canadians don’t sell cheap crap. A metro system that makes sense immediately. As much or more ethnic diversity than California; I meet people from all over the world when I go to Toronto. Round trip fares on Porter Airlines right into town for $250. I am sure there are other things in Toronto I have yet to discover, and every time I go there, it’s something new. Bring it on – I can’t wait for next time! 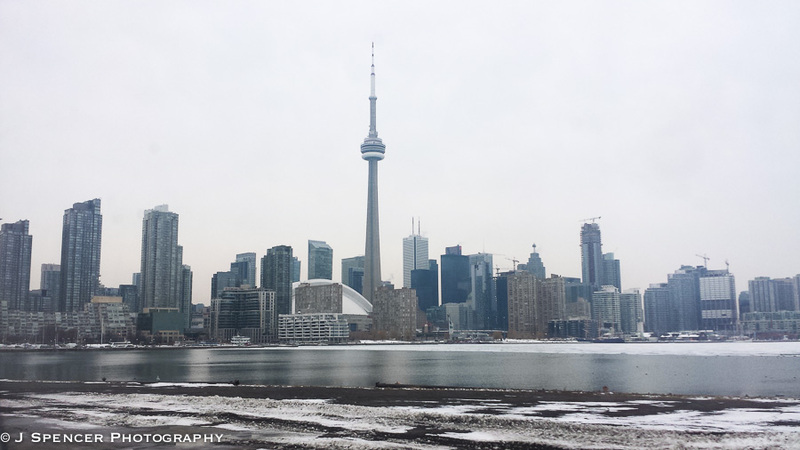 Toronto in early winter, from the tarmac. The next day in Marrakech, I started off with a beautiful breakfast up on the roof. 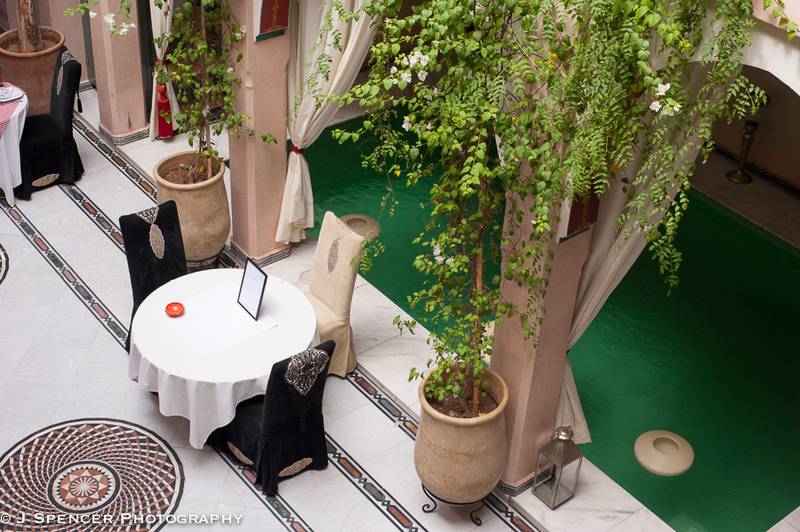 That’s a traditional location for breakfast in Marrakech, in fact, as it’s usually a comfortable extra “room” and decorated accordingly. I had a nice chat with a visiting New York doctor and answered as many questions as I could for him about the city. But I didn’t linger too long because today was shopping for lamps and dates, and also, sadly, departure. So soon? Yes, thanks to Tunisian labor concerns, so soon. I understand they are not having an easy time of it in Tunisia, or I’d be complaining further because Morocco is pretty neat and I am sorry I wasn’t there longer. But, sometimes we have to make the best of it. For me, that often means shopping: I went back to the lamp vendor. He had all kinds of interesting, high-quality things. 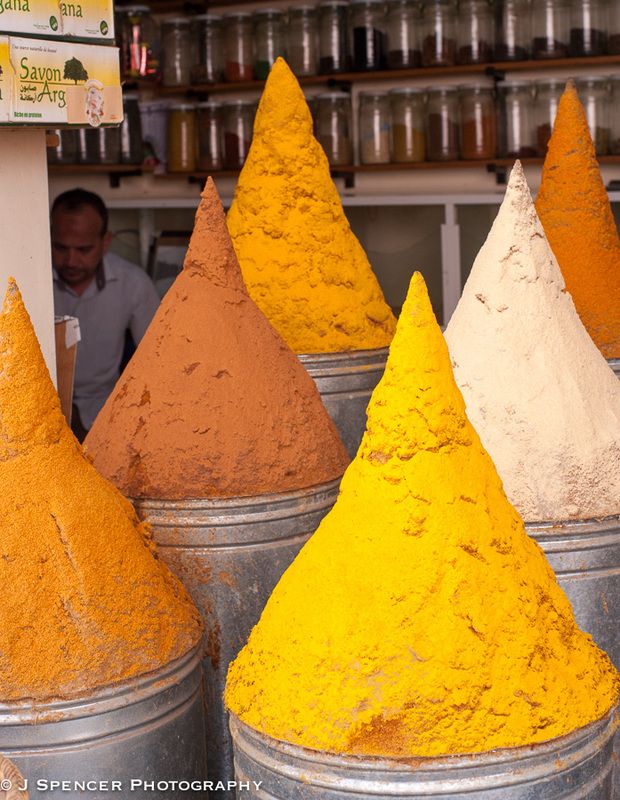 Quality varies a lot in Morocco and it’s caveat emptor – you’d better be inspecting carefully before making any purchases. But here, maybe there would be something there for my new house in Annapolis? Could I buy something that wouldn’t look ridiculously out of place back home? I found one that would look pretty anywhere, and another that matched it but did look admittedly taken from the Arabian Nights. I liked it though and thought I’d try to get away with it in Annapolis. But first, there was bargaining. 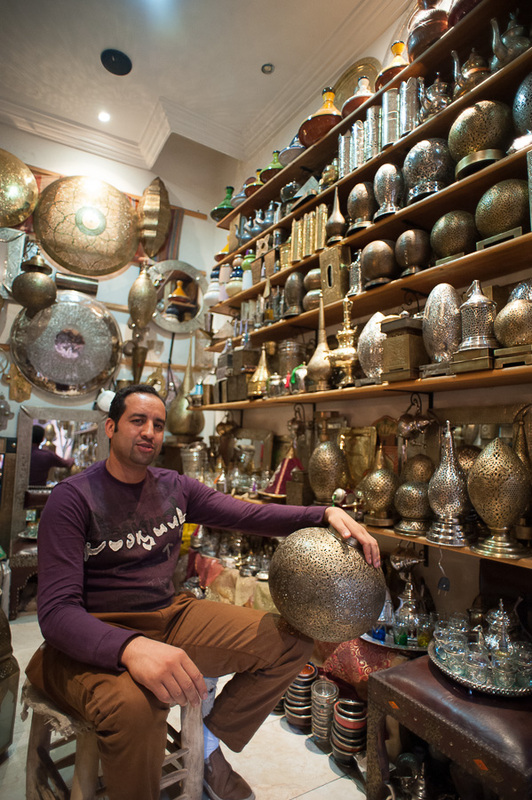 Bargaining, haggling, whatever you want to call it, is a big deal in Arab countries. If you don’t haggle, not only will you overpay horribly but you are indicating that you have no self-respect. That your time, the time it took you to earn your money, was unimportant and is not worth defending. I didn’t used to be able to do it, but before long, I learned to treat it as a game and nothing personal. It became easy then, and I now haggle all the time. It was going to be a while unless I wanted to pay a lot more money. I took my time examining all the goods, decided on what I wanted and then sat down to talk, have tea, and discuss the price. We went back and forth for maybe 45 minutes and finally settled on a figure that he said was woefully low and I said was distressingly high, so we were both satisfied. This price included packing and sending to Maryland from Marrakech, so getting it home would be no problem. It was also a cash price, so I had to go to an ATM. Fortunately, there was one not too far away. I got the necessary money from the machine, Abdellatif the shop keeper got his cash, and the lamps were going to be sent. I hoped. I believed. Generally Moroccans keep their bargains, but in haggling, you also see the measure of the man you’re up against. So while I was taking a chance, Abdellatif seemed like an honorable fellow. We’ll see. 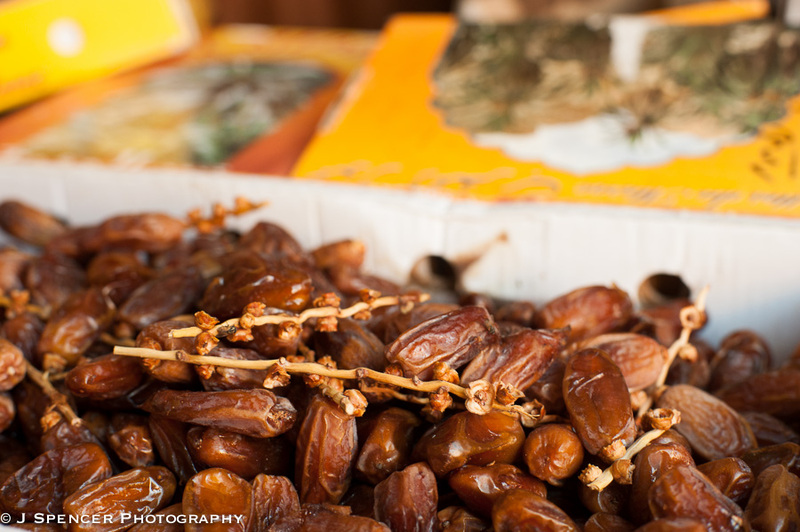 From there, Abdellatif advised me where to buy dates at a fixed price and I left the souk and crossed the street to find them. Easier said than done. I looked around for some while, but carefully since I didn’t want to advertise that I was lost. That’s a sure way to end up in someone’s brother’s carpet shop with no hope of ever leaving. I still couldn’t find dates. Finally I asked at a shop whether they had them, and while they didn’t, they provided a guide. 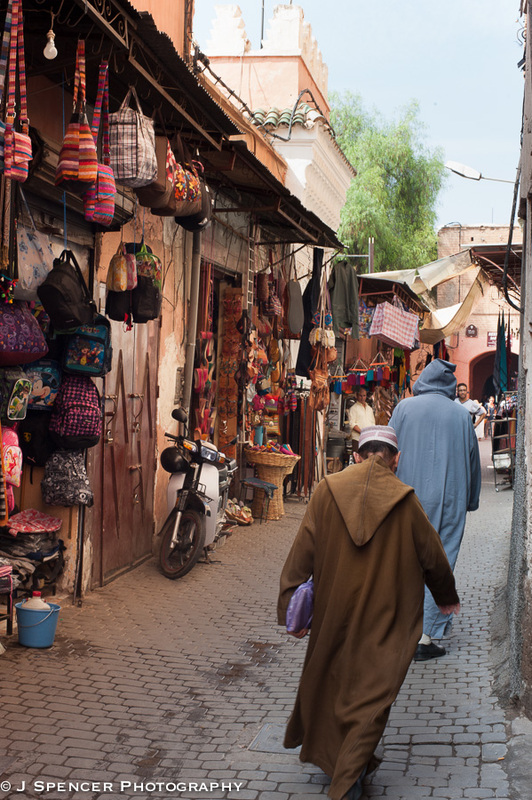 We walked first through a flower market, then a poultry market and its adjoining bloody abattoir (only in Morocco…), going through an olive and preserved-lemon stall and then, finally, into the place with the dates. I gave the man a few dirhams to say thank you, and then asked the shopkeeper for two kilos of my favorite Zahidi dates, from the Vallee du Dra. MMmm, good. These were not going to be easy to get into my suitcase, since the two kilos made a bundle the size of a shoebox, but I was determined to give it a try. Back to the hotel I went, without getting lost, and after some work, got the dates into the case. I had a delicious late lunch and then went to the airport. Remarkably, the innkeepers even packed me a sandwich and fruit for the plane without my asking! Can you imagine? What wonderful hosts. Good thing too because what British Airways was serving on the way to Gatwick was hideous. I think I was the envy of half the passengers who could smell my yummy sandwich. I transferred by car to a Heathrow airport hotel, hit the hay, and left London early the next morning for home. But what about my lamps? Did they come? Was Abdellatif a man of his word? Yes, and yes. Three weeks later, my lamps arrived thoroughly packed and mostly intact, with just a little bending courtesy of the Moroccan post. A short trip to the brass repairman in Annapolis and they were rewired for US standards, and straight. I can’t wait to hang them in my home. Since now in Morocco email is all the rage, I let our honest lamp vendor know that things had arrived safely. I found out that the post had cost Abdellatif $50 more than we’d estimated. We’d spent a while trying to guess this figure and I thought he was low. 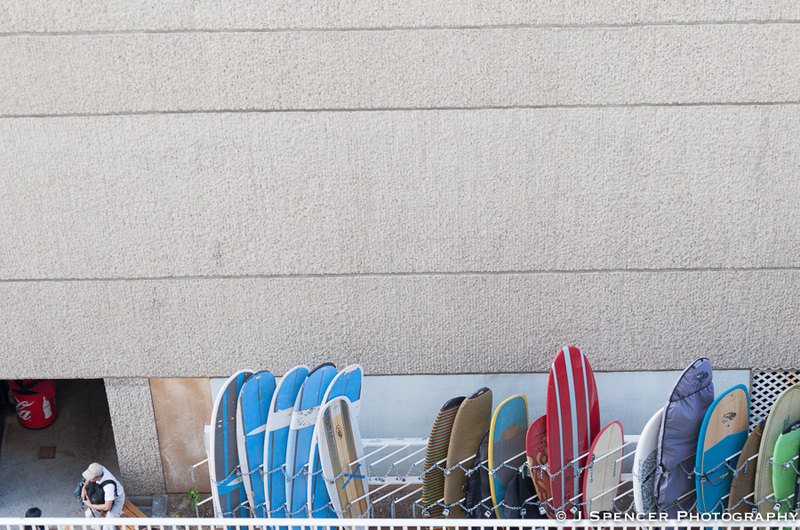 I couldn’t leave him hung out to dry, so I wired the money to him Western Union, much to his surprise. If I ever need lamps again, I know a guy. Exchanges like these are why I love Morocco and the Moroccan people, especially Marrakechies. The moral of the story? Know your vendor and your innkeeper, visit Marrakech however you can, and don’t fly through Tunisia right now. My vendor, dare I say friend (? ), and his lamp shop. The next day it was, sadly, time to depart Malta. Or so I thought. Once again, Tunisia messed with my day. Geographically, the fastest way to get to Morocco from Malta is to cross North Africa, changing planes in Tunis, Tunisia or Benghazi, Libya. Politically, however, that route is not so fast. Since there was open fighting in the streets of Benghazi, I knew not to go there. But unknown to me, the Tunisians had planned a labor protest strike on the day of my flight. I’d been sitting for four hours in the airport when I knew that my connection was shot and I’d either have to stay in Malta or in Tunis for the night – if the plane even showed. If you read my blog about Tunis, you know that I wasn’t going to stay there again unless there was no choice! Honestly, you’d think I would have known better in the first place to plan anything through Tunisia, but I was foolishly optimistic. It was at this point in the day that I did something I have never done before: requested my luggage back from the checked baggage area and refunded my ticket. Of course, Air Tunis wanted me to go back to the ticket office in town (now closed) and get my refund there, but I wasn’t going to be able to manage it since I planned to leave before they opened again. I’d been on the phone for 30 minutes with American Express arranging another ticket for the following day through Frankfurt, Germany. Not a geographically expedient route but one definitely going to arrive in Morocco! Fortunately, the Tunis Air office manager was in the airport waiting to get on this horribly belated flight, and he was willing to give me cash for my ticket and then get reimbursed later. So, standing next to my big suitcase in the airport, after writing a letter by hand about why I couldn’t make my connection and needed a refund, I received 102 Euros in cash. It all felt rather weird, but I got my bag and my money and headed on back to the hotel. I still had a bed, a swimming pool and a decent place for dinner. And no Tunisian gigolo to go with any of it! The next day, I went to the airport again, and was perfectly successful on my Air Malta flight out to Frankfurt, then into Marrakech via Royal Air Maroc. No delays, no weird problems, and I even got a pretzel. The riad’s driver met me at the Marrakech airport. Holy crow, the airport. How the place has changed! I mean, really changed. The tiny little pink stucco airport I remembered was now a major construction project with two big stories and a wing addition the size of a football field. There was a Dior shop up in the departure area (There’s a departure area?? Not just one big room for everyone?). Oh my gosh. There were more than two gates. And what’s this? Mopeds everywhere! And what are those flowered fabrics I see? Hey! The women are driving the mopeds, sometimes by themselves! Amazing! And wonderful! What an improvement. The native ladies were still covering their heads but not their whole faces and they nearly all had on long Moroccan caftans with pants instead of burkas. Driving, wow – I was thrilled for them. I was a little sad not to see all the donkeys on the road but progress has arrived in Marrakech, no doubt about it. Tradition is still alive, especially the best parts: my hotel welcomed me with rose water for my hands, and for my refreshment there were dates, milk and of course, mint tea. I was shown to a quiet and lovely room where I freshened up, ordered some dinner to be eaten later, and then girded myself for the souks. I had a list of things to purchase, a short time to do it, a strong will to negotiate and a fistful of dirhams. I was ready. The trading has gotten a little harder along with the signs of progress, though, as often happens. Still I did not despair. Before you knew it, I was saying “La shakrun” (“no thank you”) and walking past, never stopping, but making notes about the places I wanted to revisit. Fortunately now I know the souks well enough to know that I must be very observant about which way I go and how I move, and who is watching me. That way, I can find my way back to wherever I want to be, I will know who is up to no good and who I don’t want to bargain with. An hour later that evening, when I had explored my options and knew where I wanted to shop, I began to negotiate and eventually, two hours later, I had most of the things on my list. I was even entertaining the idea of buying something the next day from the lamp shop. For now, I had to leave the cobras, dervishes, dates and food stalls of the Djema El Fna to hurry to have my dinner at the inn. And I am so glad I did! That is some of the best food I have had in a long time and every bit of it was all of my favorite foods. I don’t know how they did it, but we had a small tagine, some small couscous, a bistilla (pigeon, egg & cinnamon pie in a phyllo-like dough), and cucumber and tomato salad – everything I love was there. There were even little cookies for dessert. I was in heaven. What a way to end the day. Even Tunisia couldn’t spoil it! 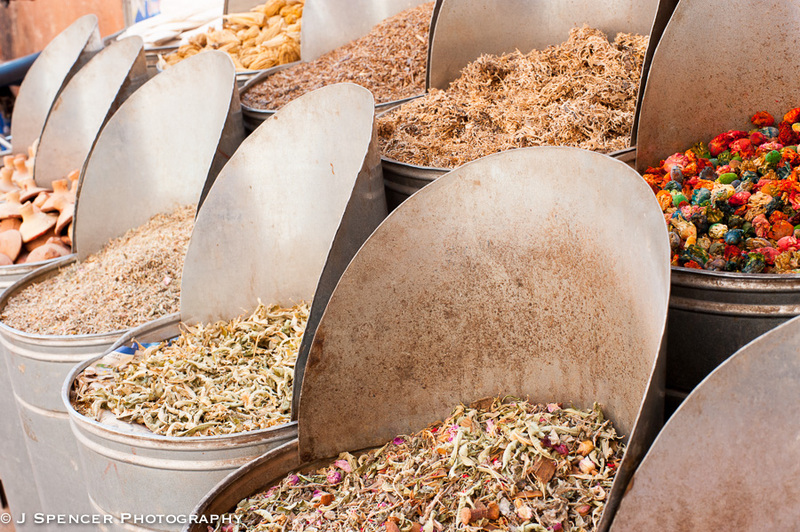 The souk in Marrakech, Morocco. Men in traditional dress. 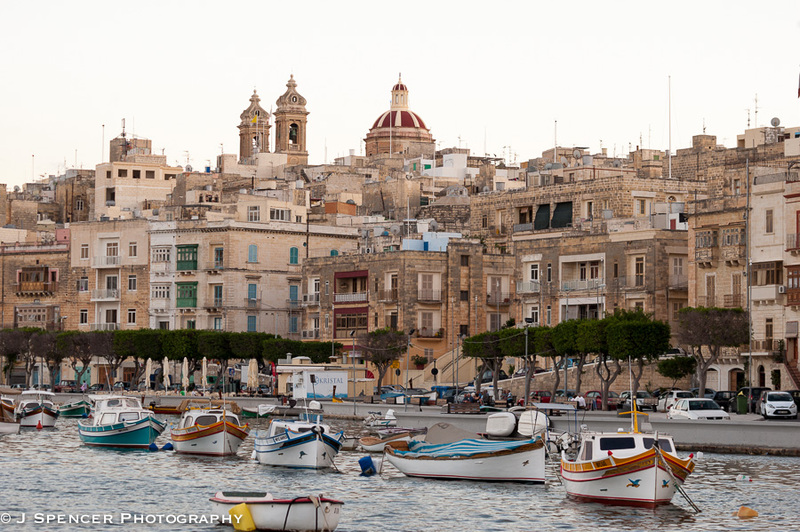 Malta and Gozo: Oh My. It had been a while since I’d left North America. Almost an entire year! This was serious. I had been itching to go away for quite some time, and when the opportunity finally presented itself, I jumped at the chance. Where to this time? 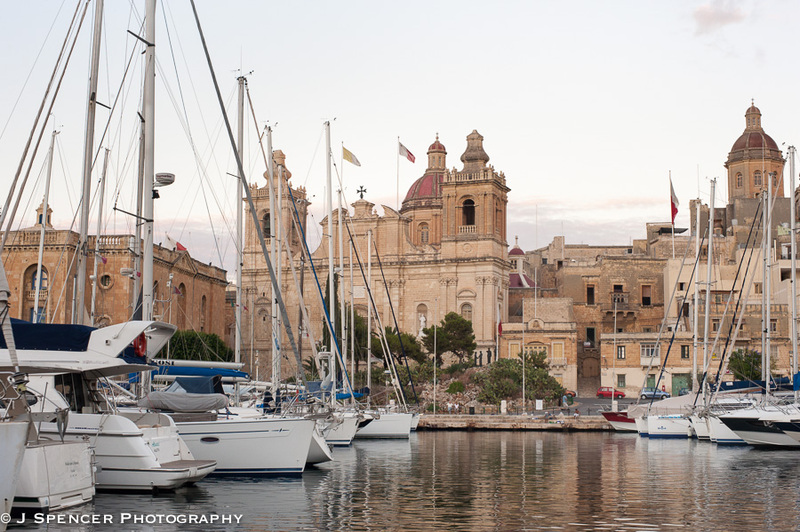 Back to the beautiful island of Malta, its neighbor Gozo and if I was lucky, Morocco. Lucky? How does that happen exactly? I mean, either you’re going or you’re not, right? Well, no, not quite. But I am getting ahead of myself here. Let’s talk about Malta. I like Malta, a lot. It’s beautiful, cultured and there are a lot of boats. What more could anyone want? 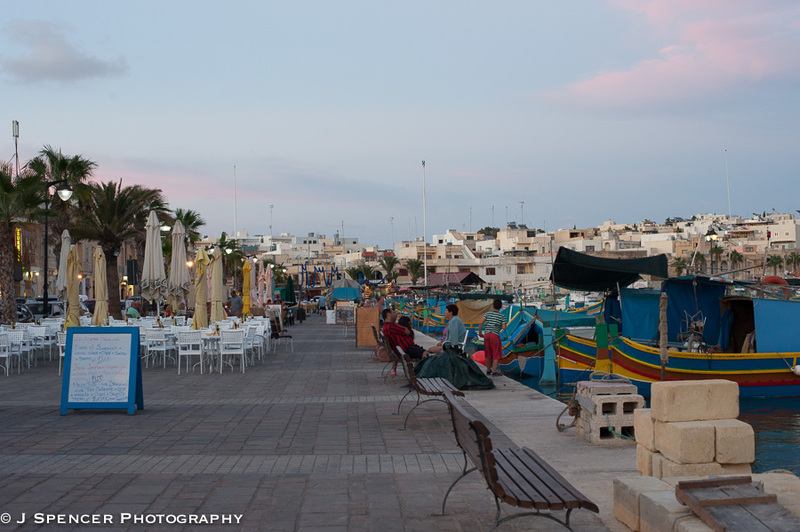 I had dinner in the charming fishing village of Marsaxlokk once again, and watched the men darning their nets, caring for their boats and the ladies selling the catch for dinner. It was so pleasant to sit and eat by the water in fine weather with nowhere else to be. 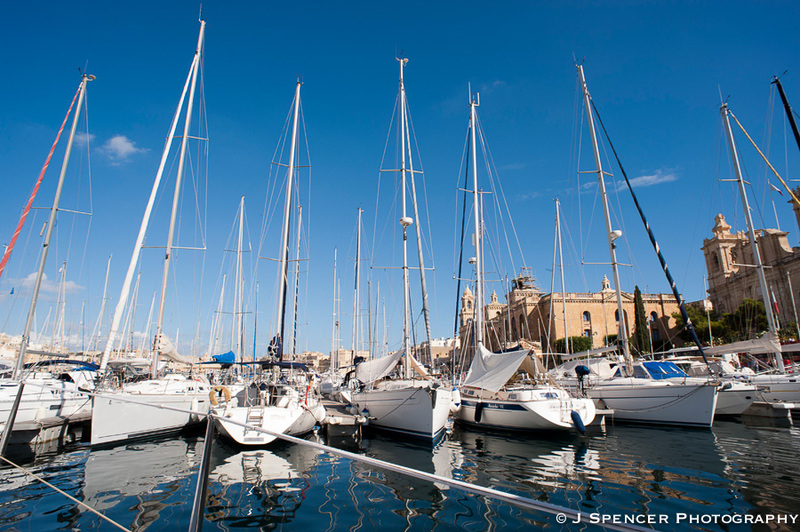 This visit, I decided I was going to get on one of those many Maltese boats. Despite its being Malta’s Independence Day, I managed to get a yacht chartered out of San Vittorio to go up to the orange sand beach on Gozo and around. What a treat! Boarding was at 9:30 AM after a little ride down to the harbor, and the sailing yacht was a trim little German-built thing that my grandfather would certainly have approved. The captain was ready for the journey with lunch and everything. 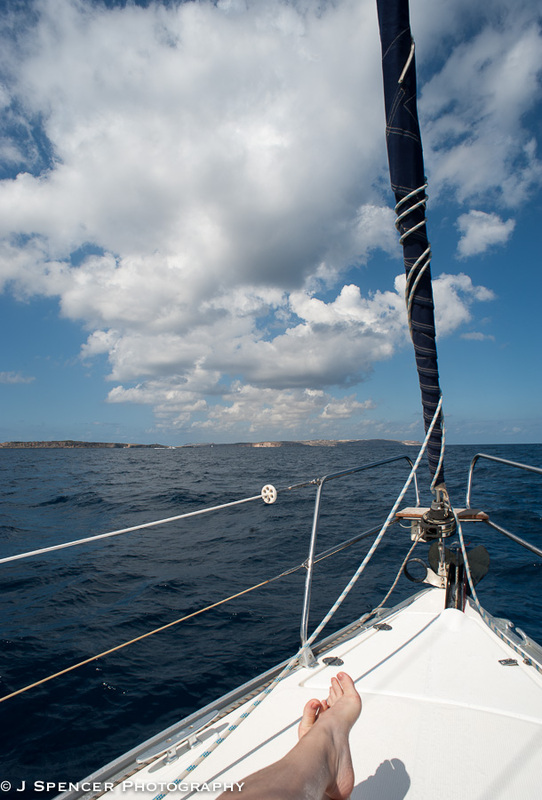 It was a fine day out with a bit of headwind, but it was a pleasant enough journey up to the island of Gozo. I put on my swimsuit and headed up to the bow to work on my tan. It was a little rough, so sleeping was out, but it was fine to be underway and independent. This went on for a couple of hours, very pleasantly I might add. Soon the boat had arrived at the orange sand beach. 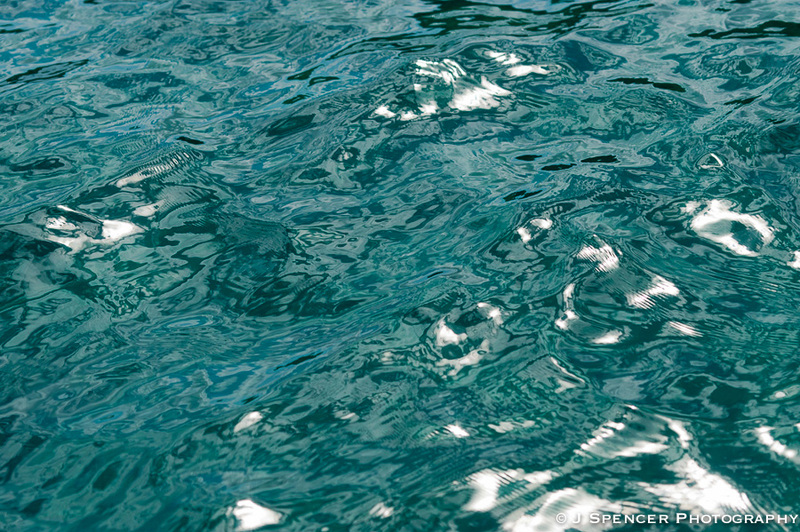 Together with the aqua clear water of the Mediterranean, it made a beautiful scene. I jumped in, meaning to swim in to the beach if I could. The sea was warm and very salty. Unfortunately, it was also choppy and rough, hitting me in the face with regularity, and there was a noticeable current. I knew that if I swam to the beach with the current I would not be likely to get back. I am simply not strong enough. And then I’d be stuck, dripping wet wearing only a bathing suit but looking for a taxi back to a ferry to my island and then again to my hotel. Yeah… No. Not a good idea, no. Sigh. I swam around a little, not too far from the boat in fear of losing it, and had a challenge getting back just as far as the stern. Thank goodness I had not gone any further or it would have gotten embarrassing. I washed off the salt and toweled off. Instead, lunch would have to do. I ate and it was good. We weighed anchor and went back the way we’d come. It seemed like a nice idea to try using the wind, so the captain unfurled the sails and we gave it a go. I even got to man the wheel for a little bit. Unfortunately, all that wind we’d had in the morning was gone. While we had wind for a few minutes, which was really fun, mostly we luffed. Rats. Back to the motor after all. Well, it was a fine day so no loss there. I learned that the captain had been in many races and even won some, and that he had a young family that also loved sailing. It is good to be out with someone like that – someone you know wants to get home safe but also loves his boat. Finally, we reached Fort St. Elmo’s and the harbor and we had a slow cruise around to see all the shipworks in progress. The big yacht show was coming up and there were some very fancy vessels moored in the harbor, one all the way from Bikini Atoll, along with a huge offshore oil-drilling rig in repairs. There were some local fishing boats in the harbor, too, and everyone was making for port as it was near sunset. The city seemed old and fine that night, tranquil in the gloaming. I don’t think it gets much better than this in Malta, or maybe anywhere. 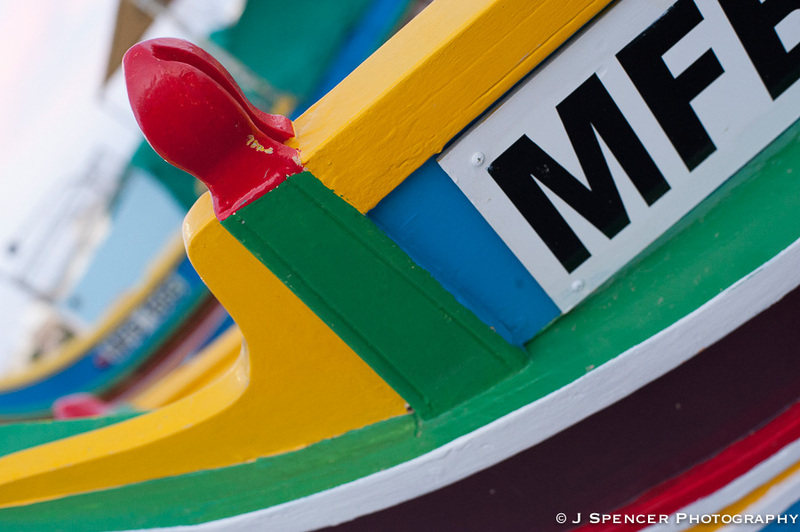 Close up of the Maltese boats. On the bow underway – happy day! 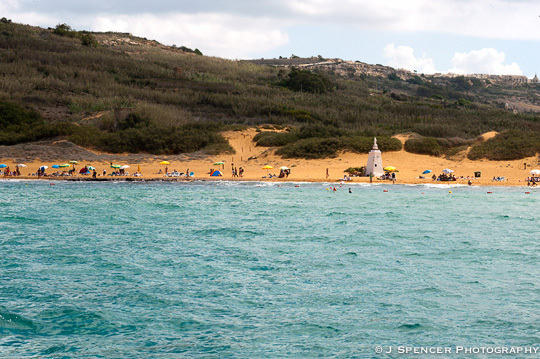 The orange sand beach at Gozo. Too much current to swim to, unfortunately. The Mediterranean Sea at Malta – what a beautiful color. 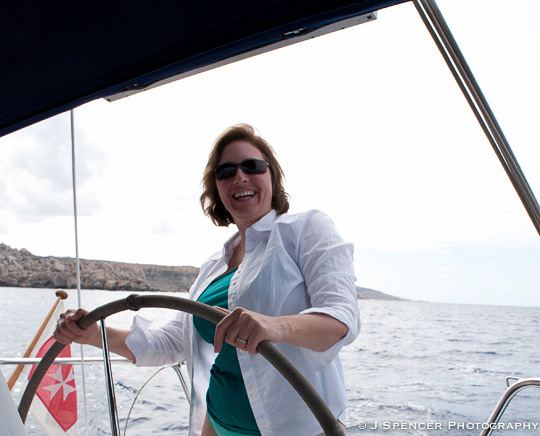 I can’t believe the captain let me drive under sail! The harbor and its church. 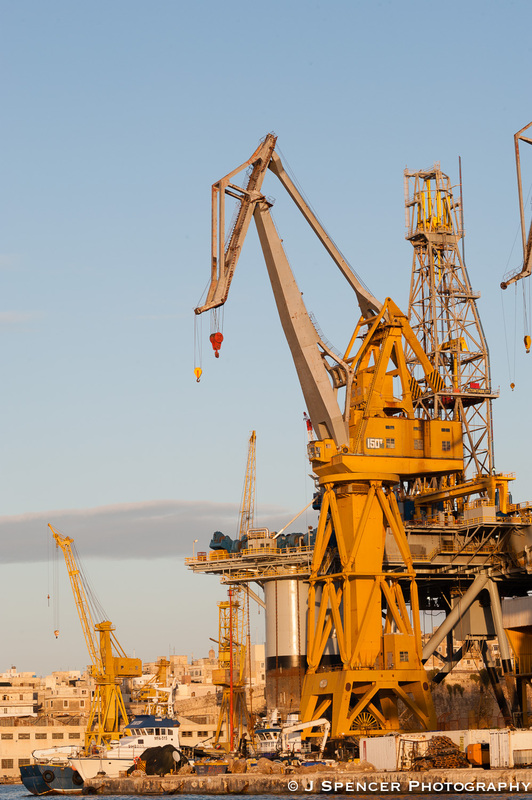 An offshore oil rig in dry dock in Malta’s harbor. Their shipworks is top notch. 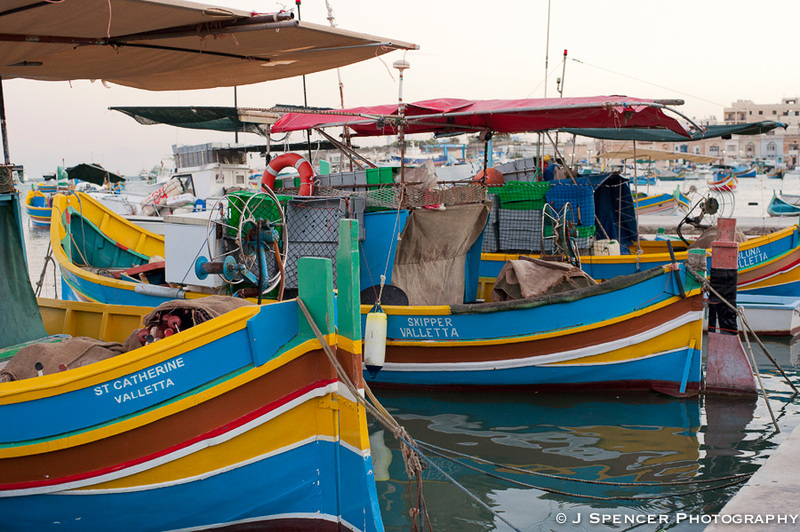 Returning home to San Vittorio harbor and its fishing boats. 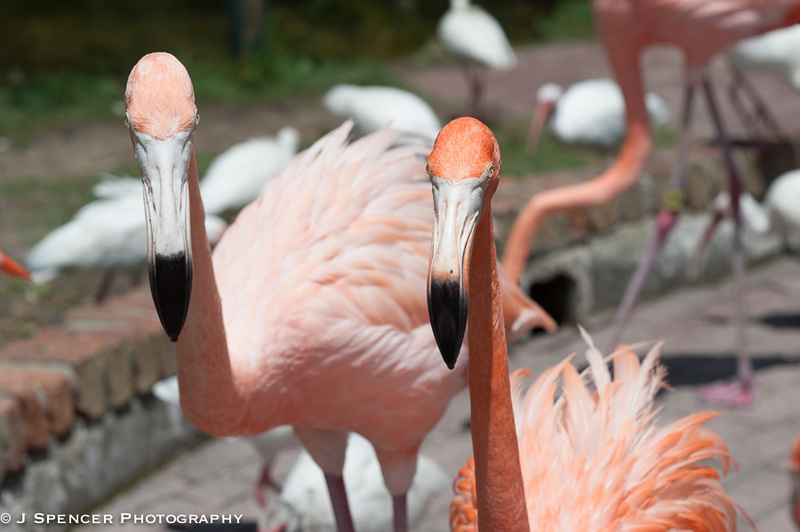 They Let you Feed the Flamingos! Florida, in midsummer? Are you sure that’s a good idea? Hm. In Maryland we’re already experiencing the worst humidity outside of Indonesia anyway, so why not? How much worse can Florida be? None worse at all; in fact I enjoyed the weather more. One soggy, hot Friday afternoon, I went to the Baltimore airport and got on a plane packed with happy mouse-eared travelers. After a few hours and some waiting, I met my friend at the Orlando airport, we rented a car and we tried to find the hotel. The roads in the vicinity of Disney World get pretty confusing, or we would have been there quite a bit earlier. My getting lost is not limited to the Beltway, it would seem, and has extended all the way to Mouseville. Eventually, though it was nearly 1:30 AM, everyone got settled. Reconnecting in the middle of the next morning, droopy-eyed but childishly excited, we boarded the hotel bus and headed for the Happiest Place on Earth. After buying some expensive entry tickets we put away our money and regressed a few decades on our way through the gates. I’d never been to Epcot Center before, or Disneyworld for that matter – only Disneyland in Anaheim, California (the original). In the Disney tradition, everything was beautifully manicured, spacious and somehow made into a place where you don’t need to worry about anything. I don’t know how they do that, but it’s awfully nice. Soon into our park time, we tried the astronaut training mission ride. It is now, to my sorrow that I must report I will never make it through real astronaut training. This is a disappointment for me, even though I am flabby and over 40 and had mostly given up on going to Mars. Still, there was still a sliver of hope in my imagination until this experience. Disney gives you the option of a rougher experience or an easier one, and I in my ignorance chose the rougher ride. I figured since I had never been motion sick, I’d be fine. Nope. Nuh uh. The G-forces of the ride made me so disoriented and sick, I had to sit down for about 30 minutes afterward. Then, since I looked woozy, my friend suggested we go have some water and some food. Neither of us was feeling very good and we were kicking ourselves for not taking the easier ride. I had lost my dream of space travel… sigh. The only place not serving fried whatsit was a restaurant upstairs in the French district of Epcot. Turns out that Epcot is made up of many slices of culture, each made to look and feel a lot like other countries around the world, complete with foreign workers from the country in question. So, we met French Algerians and Parisians in the restaurant, and enjoyed what was a surprisingly decent and reasonably authentic meal. Later, I met a nice woman from Morocco (did you know Morocco was the first country to officially recognize the United States? I learned that at Epcot.). We discussed my love of her country and she told me about her home town. We moved on to Norway where I asked for snacks of dried cod. My oldest boy liked those when I sent them from Bergen, so I had hoped to get him some more. Unfortunately, they didn’t have any and the Norse fellow working there was lamenting it as well. Meanwhile, time was pressing on and it was getting dark. Before long, the amusement park would be closed. We had seen plenty of Epcot all day so it was time for a change. We took the monorail, transferred at one station, and hurried on to the amusement park. After some favorite rides, we finished the evening just in time for the electric light parade. I was reminded of the times I’d been here with my mother and my own boys, and it was a lovely way to end the day. 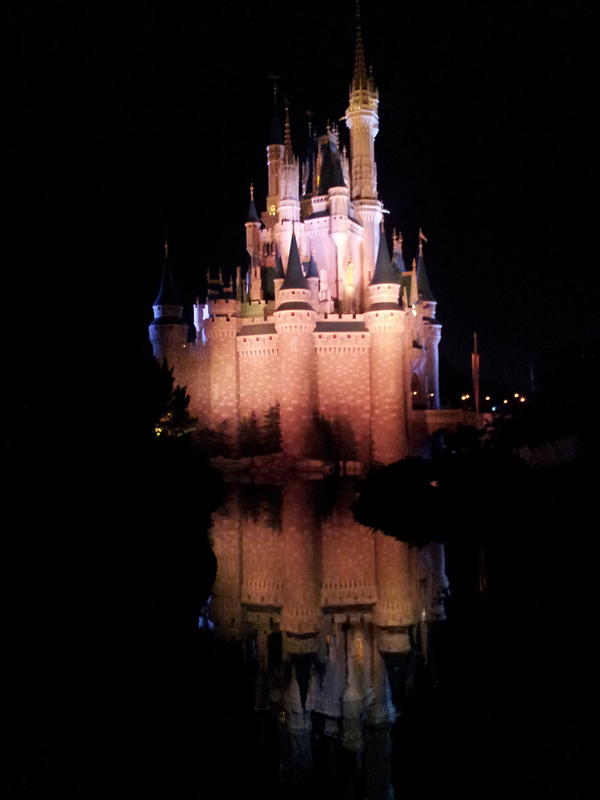 If I had to only have one day in Disneyworld, Orlando, this was a fine one. 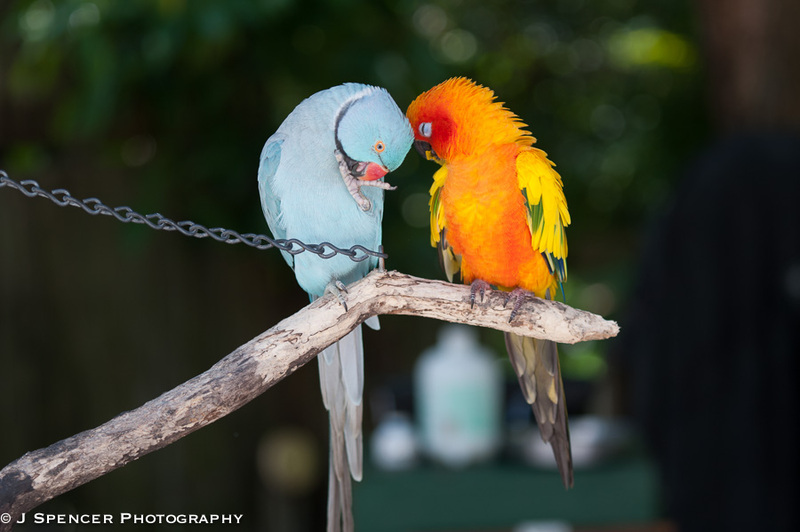 The next day involved a drive over to Naples and a bird park in Sarasota. To be correct, it was a bird and reptile park, but I had heard it was more about the birds. Still, the reptiles turned out to be pretty cool, and I saw a Burmese python and a young crocodile that you could pet and photograph if you wanted to. They had a bunch of beautiful parrots, too. But the big draw for me? They let you feed their flamingoes OUT OF YOUR HAND! Does it get any better than that? I don’t think so! 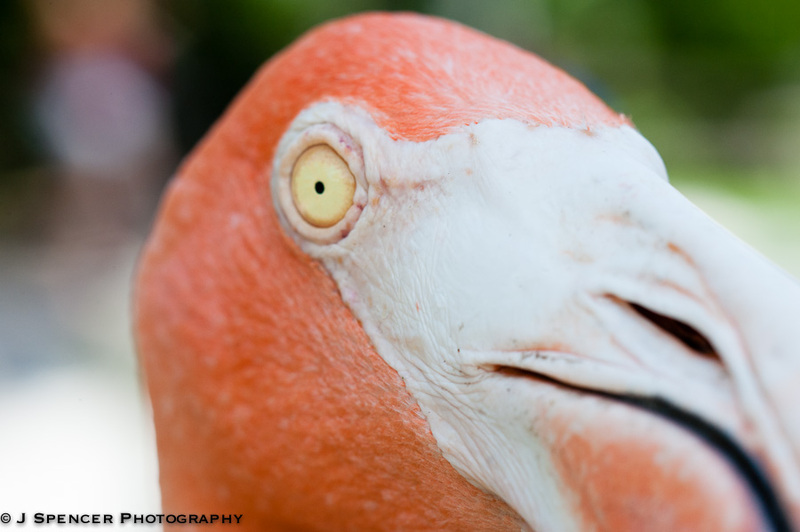 I bought a bag of food with my admission ticket, watched the reptile show, took some pictures of the parrots, and then walked the trails until I found the big pink flock. I took some pictures before getting the food out, and then I fed some ibises nearby. 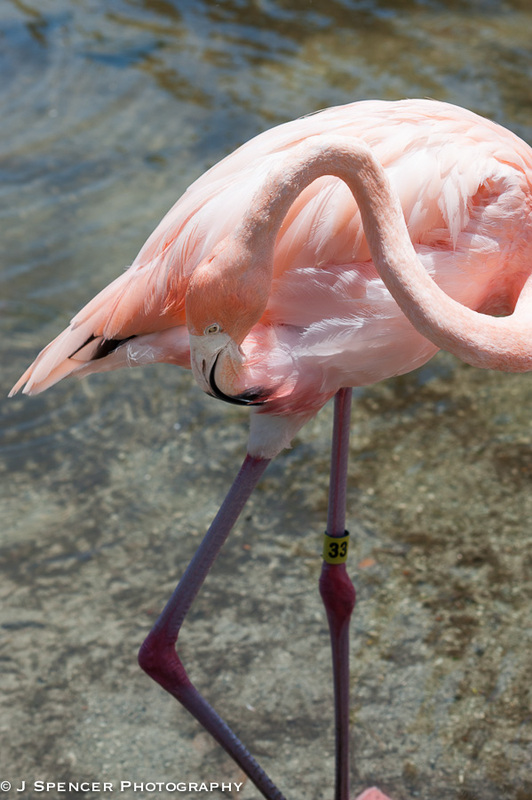 The next thing you know the flamingoes were upon me. It was just the neatest thing. I photographed their very interested faces and tried to keep them in focus while not losing all the food in under a minute. 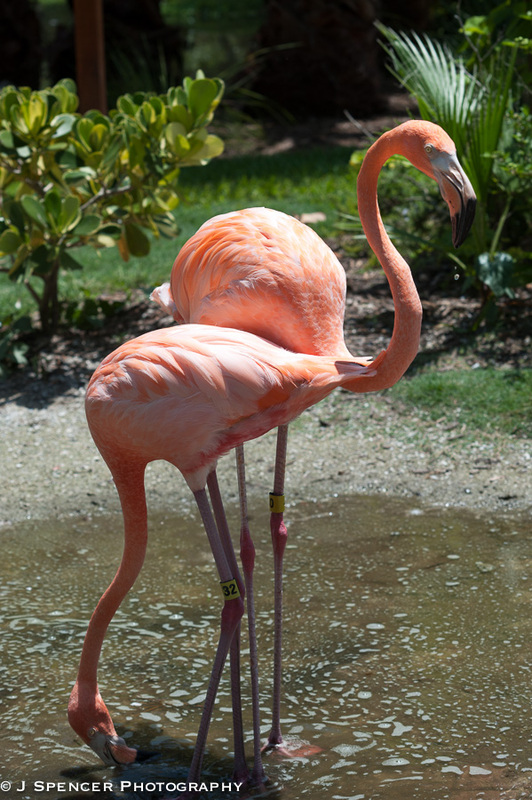 Turns out my office mate had been here years ago and when I told her about my adventure, she remarked that she’d had flamingoes all the way into her pockets seeking out the food pellets. I could imagine that: they were not exactly aggressive but they were very interested. It was the best $5 I spent all year, no question about it. 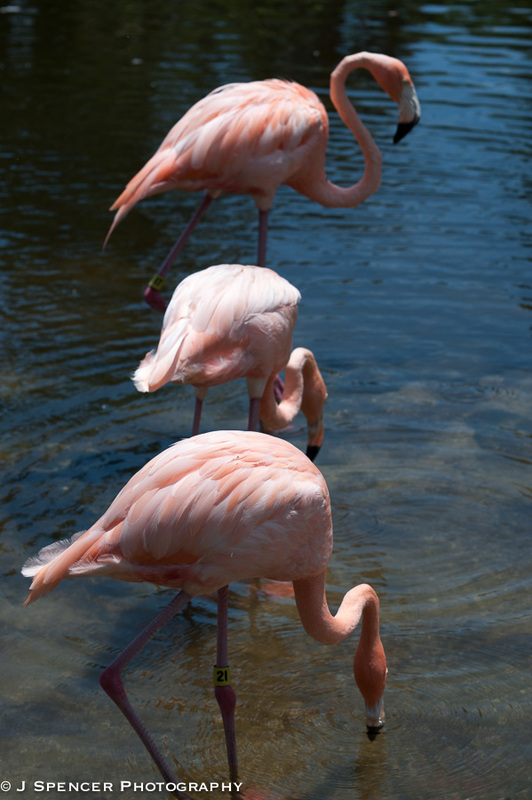 The next time I am anywhere near Sarasota, I am going back to those flamingoes, for sure. Laughing and happy, I got into the car to meet my friend for dinner. We both agreed it had been a wonderful time and to heck with concerns about humidity! We ate Cuban food on the water until we couldn’t anymore and headed for the airport like a couple of fat cats: birded and well-moused. 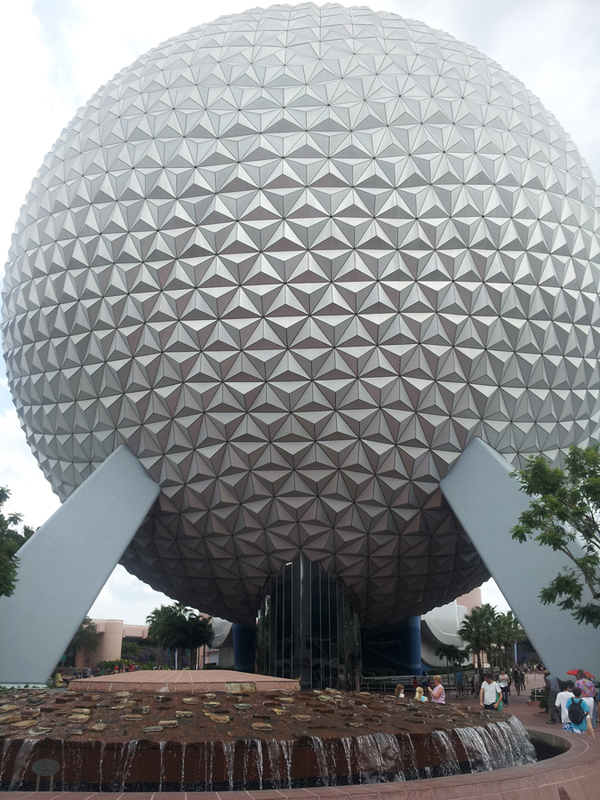 The Epcot ball – it’s a classic. 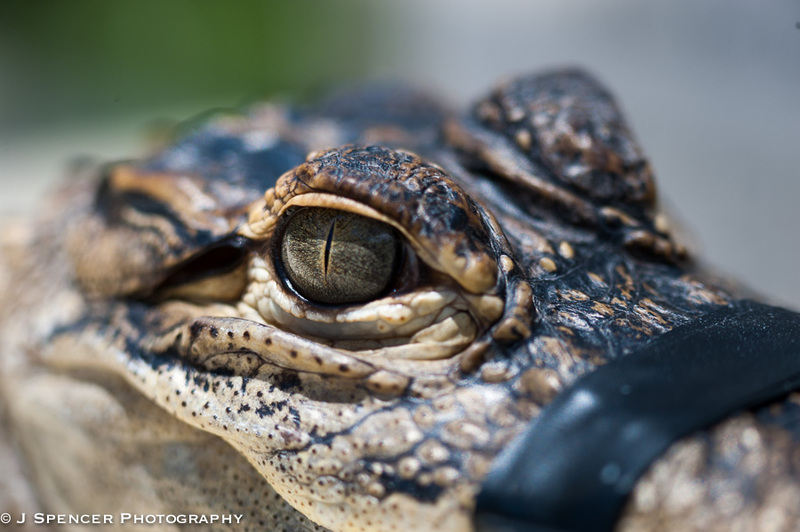 Young crocodile – thank goodness for electrical tape. I know there is more food in that bag. I know it!